Infinite Art Tournament: The Infinite Art Tournament, Round One: Pannini v. Parmigianino! The Infinite Art Tournament, Round One: Pannini v. Parmigianino! Did you put bread and cheese together deliberately? I am voting for Pannini. I like the second artist with the tallest baby ever. That kid is gonna' hoop! Pannini, who I think was related to the Earl of Sandwich. 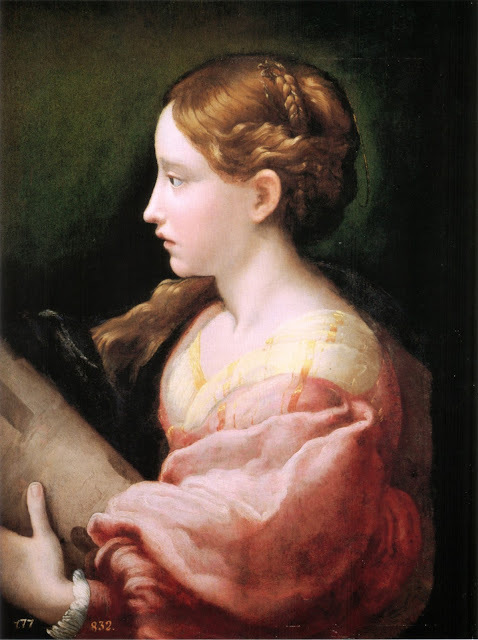 Hey, I like Parmigianino. Not the creepy long baby, but Self-Portrait in a Convex Mirror, etc. 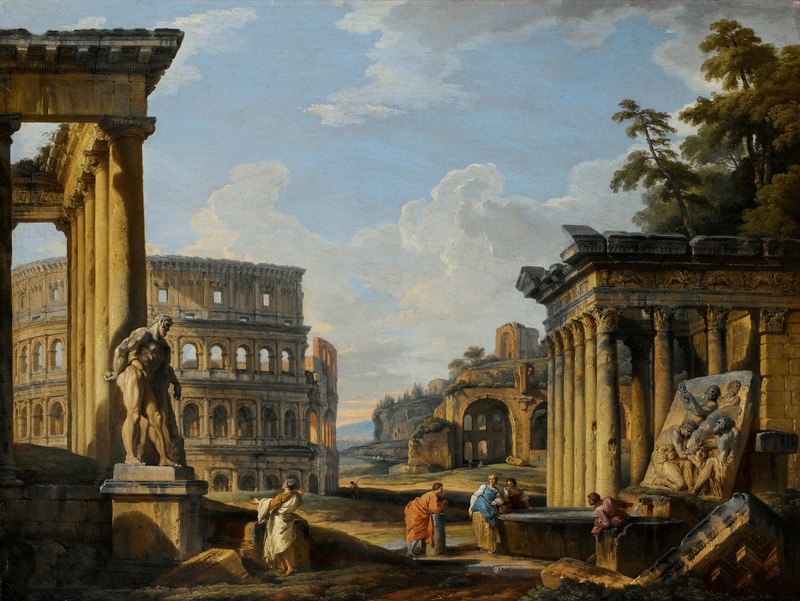 I usually really like paintings of architecture, but Pannini's seem, well, cluttered, and lacking in hierarchy. Not into the stork woman with the tenuous hold on her baby. Am into the architecture pictures. Parmagiano. I wonder what she's going to do with that demon child. OK, I feel like we're supposed to go for Parmagiano: "The painter wanted to be unorthodox. 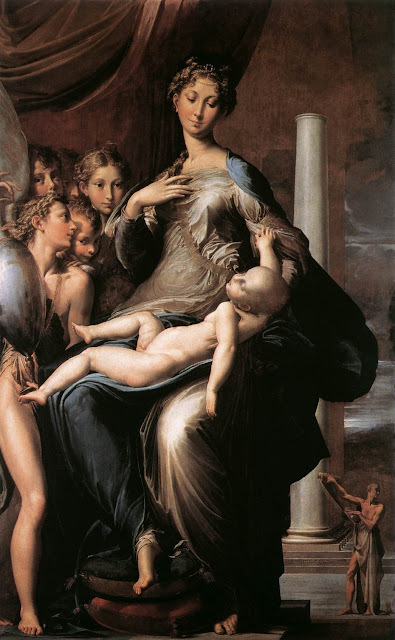 He wanted to show that the classical solution of perfect harmony is not the only solution conceivable ... Parmigianino and all the artists of his time who deliberately sought to create something new and unexpected, even at the expense of the 'natural' beauty established by the great masters, were perhaps the first 'modern' artists." Whereas Pannini is just a souvenir-from-the-grand-tour sort of guy. But, I've always found the Madonna of the Long Neck kind of unpleasant, departing from realism enough to make me a little seasick but not enough to get interesting. It looks like an unnecessarily elegant "what's wrong with this picture" puzzle. Whereas Pannini, who is also freely chopping up and rearranging the landscape into something quite artificial, at least does so with a certain gusto and good cheer. So I'm going with him. Panninni. I'm impressed as all get-out with Pannini's details, but when I googled Pannini and Parmigianino, I thought that Parmigianino had better range in portraits than Pannini did in his field, so despite the fact that Parmigianino's portraits tend to have freaky eyes, I'm going to go that way. And that wraps up the match, with bread on top of cheese, eleven votes to four. Enjoy your lunch!